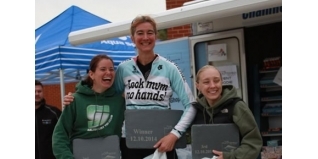 Cycle time trial specialist Rebecca Slack added an extra triathlon to her season on Sunday when she took part in the debut Huntsman Triathlon from Always Aim High Events. After a poor performance at the Snowman Triathlon last week, could she end her triathlon season on a more positive note this weekend? 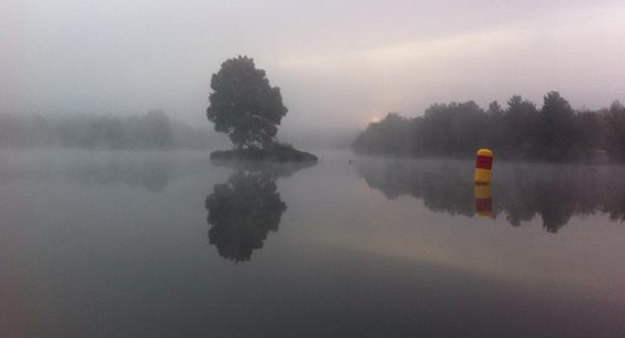 The inaugural Huntsman Triathlon – a competitor's perspective. It's hard to know what motivated me to enter the Huntsman Triathlon other than a masochistic desire to lay some demons to rest after a disastrous swim leg in last weekend's Snowman triathlon. 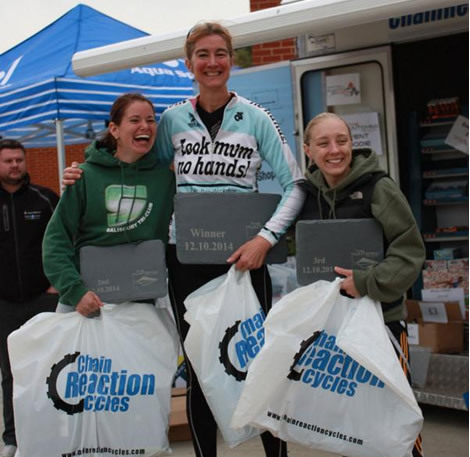 The Huntsman Tri is a new fixture on the triathlon calendar - you never quite know what you're going to get with an inaugural event – it's a bit like sticking your hand into a bag of Revels. But as a veteran of two Snowman triathlons, run by the Wales based Always Aim High Events, I knew this one would be another great, professionally run event with a fantastic atmosphere. Also with just a mere 32 miles separating the race venue from my home, it felt like I was competing in my back yard. Last week's 500+ mile round trip for the Snowman triathlon was well worth the trip…. but the trip was inevitably a very long one! A 1,500m metre swim in mid October certainly wasn't the event's key selling point from my perspective. The water was surprisingly warm though at a balmy 14 degrees– it's just a shame that the air temperature was only half that early doors - although it did give rise to a lovely cloud of mist on the water. Hawley Lake is a first class swim venue with a nice ramp into the water which is traditionally used for launching sailing boats. The start of the swim was the usual sub-aqua sumo showdown but on a positive note the water tasted pleasant enough even if its murkiness meant I couldn't see the feet of the swimmers in front that seemed to be kicking me in the face for first 200m. I'm accustomed to coming into T1 to find a pile of tumble weed and a load of empty bike racks. For the first time ever, I'd beaten a fair few out of the water. I attribute much of that improvement to leak free Aqua Sphere open water goggles I'd won in last week's Snowman triathlon. At that point I knew today was going to be a good day. I'm ummed and ahhed about what to wear on the bike as I splashed my way through the swim leg. The air was warming up nicely as I got out the water but my feet certainly weren't. I erred on the side of caution and put a cycling top on – the extra layer certainly felt very welcome when I started generating a 25mph headwind out on the main road. The early miles of the bike leg were very busy – with riders on both sides of the road and plenty of impatient drivers but it soon quietened down. The clockwise bike course meant lots of right hand turns - as a seasoned TTer my bike and I don't traditionally do right turns at speed, (except when emergency stopping for cake at the top of Box Hill!). In the event, the course rode quite well although I had to come to a complete stop three times at junctions, but the stops meant welcome pauses for breath. As a specialist biker, the bike leg is where I hope to make up time lost in the swim. I'd got my Marianne Vos legs on today and my power meter was giving encouraging readings. The fact that the bike leg was a few miles over standard distance certainly helped my case – but I as I neared the end of the course I rather wished it was a 69km bike leg like the Snowman rather than a 49km one! There were lots of twists and turns and the occasional bit of gradient over the course – but it was all doable in the big ring. I arrived in T2 feeling surprisingly fresh and ready to take on the trails. I know the woods well as I've raced there often in the Thames Valley Cross Country league so looked forward to all the hilly climbs and sinking sand. As it happened, the course was much kinder than the running events I'm used to, although I felt like I was running the first 2km in cleated shoes as my feet were so cold! I was oblivious to my position in the race - the cheery marshalls were generous in their encouragement, but a little backward in giving out race position intelligence - so I pounded round in ignorant bliss that I was the leading lady. The 10km run seemed a little over distance and the finish line was a depressingly long time in coming. There was a little confusion as I approached the line as to whether I was the event winner but thankfully the tape was put in place just in time. Then it certainly dawned on me. I'd won! My elation was matched with disappointment though that my family hadn't been there to watch this special moment. The prize giving ceremony was full of the usual pomp and circumstance that is a feature of all Always Aim High events and the prizes were incredibly generous too. I was chuffed to pieces to win a fantastic Suunto Ambit 3 sports watch, a pair of Salomon trail shoes, some Aqua Sphere goggles, two pairs of Superfeet and an industrial sized container of Kinetica energy powder… oh and of course an iconic Always Aim High slate trophy. As I drove home marvelling in my own glory, I was trying to work out how I'd managed to pull off my maiden triathlon victory at the age of 47. And then the penny dropped. The fact that the great and the good of the triathlon world were all in Kona today, or had been up all night watching it, may well have been a contributory factor….. Here's hoping the Huntsman and Kona are run on the same weekend again next year then. I'm looking forward to it already. For the record, Paul Franklin (@pwf48) tweeted this after the event. I couldn't agree more. Many companies do Triathlons. @aahevents do spectacular triathlons!